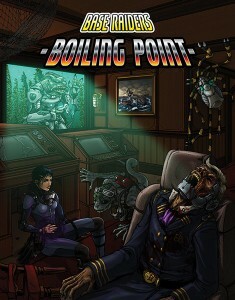 News: Please support our latest Kickstarter, Boiling Point! It’s a brand new adventure for Base Raiders and stretch goals will include a death trap focused supplement by Caleb! Ross Payton (Base Raiders, Zombies of the World) and Caleb Stokes (No Security: Horror Scenarios in the Great Depression) talk about their podcast, RPPR Game Designer’s Workshop. See how the experiment to document the creation of an RPG system from scratch to publication in real time is going so far. Both creators will discuss game design in general as well the projects they are currently working on. Questions about the podcast, game design and anything else are welcomed from the audience. Have you read about the Flaneur literature/movement? It’s one of the subjects that get taught in Urban Geography 101. It sounds like it ties well, but maybe not directly into your “experience of place / architectural horror” game. I have heard about the Flaneur movement – it’s part of the swirling stewpot of influences that will inform Ruin. That, psychogeography, urban exploration, etc – it’s all going in.